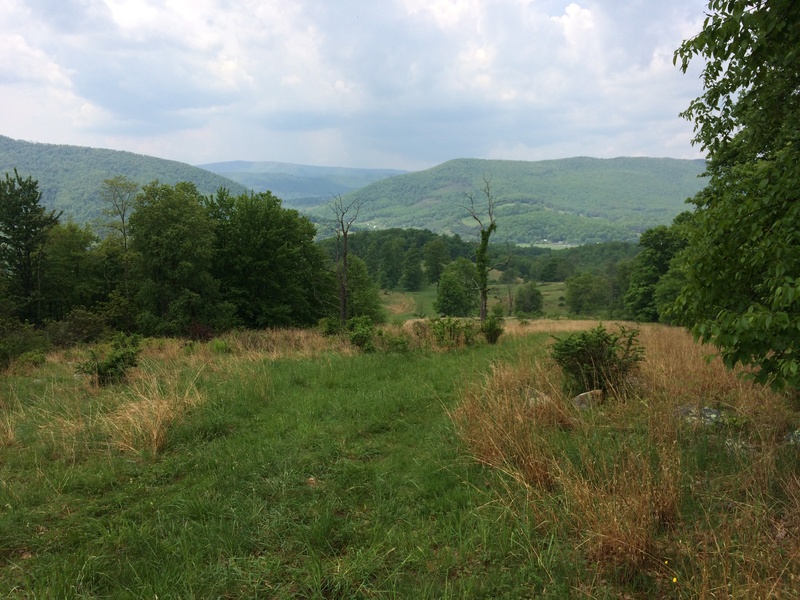 View of Vanderpool Gap, Highland County, Virginia, looking west into Blue Grass Valley. 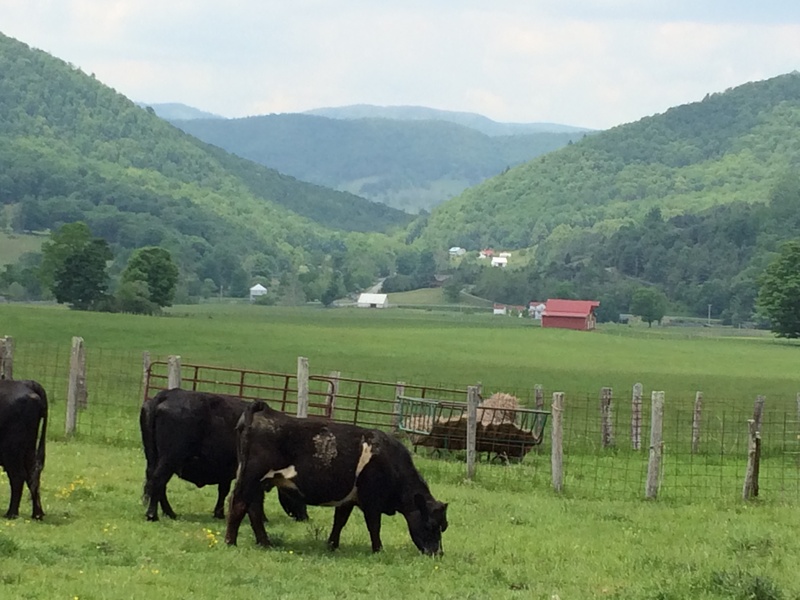 I am back, in Highland County, Virginia, exploring again, starting off a few feet from these cows. We are headed east in jeep and on foot into a parcel of land that was once cleared, but is growing back into the wild in places. As is usual here, we have to go through several gates before we are into the parcel. 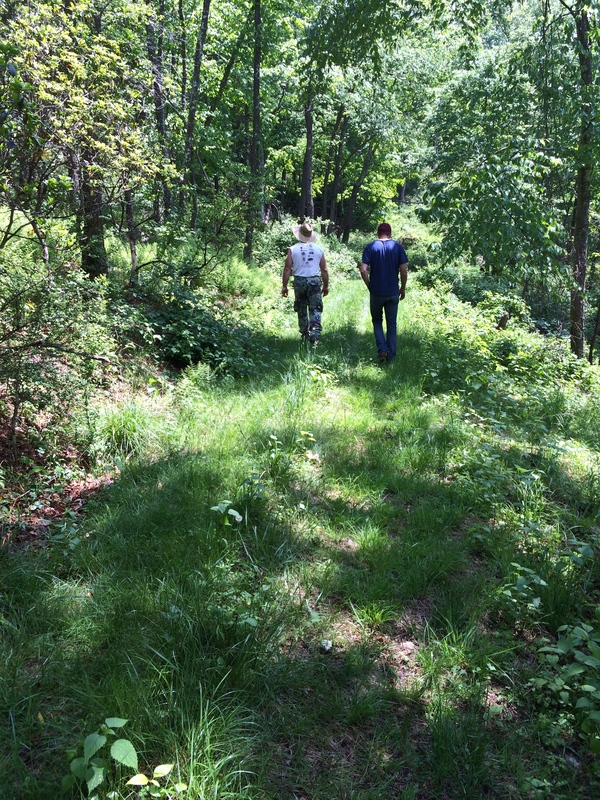 We are trying to get a sense of the entire topography of this 700-some acre parcel. It’s varied, rarely flat. We surprise a golden eagle and a bevy of vultures. They scatter in a leisurely fashion, in no hurry to leave the carrion they have found. When we have passed along, they will be back. I am not quick enough to capture the golden eagle with my iPhone, even though it is huge and moving so slowly. We arrive at a little glen with a beautiful stream. It’s sparkling and luxuriant with vegetation. Here I find a notable Appalachian wildflower: Saxifraga micranthidifolia, commonly known as branch lettuce or mountain lettuce. 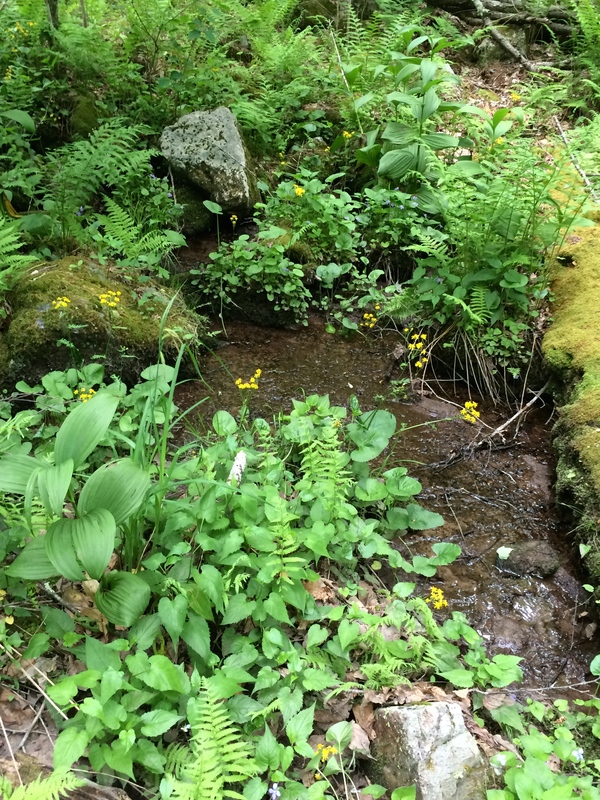 Native to the Great Smoky Mountains, it flourishes in cold, fast-moving mountain streams and is one of the first plants to show itself in early spring. The early settlers found it palatable and a welcome salad green after a long winter. 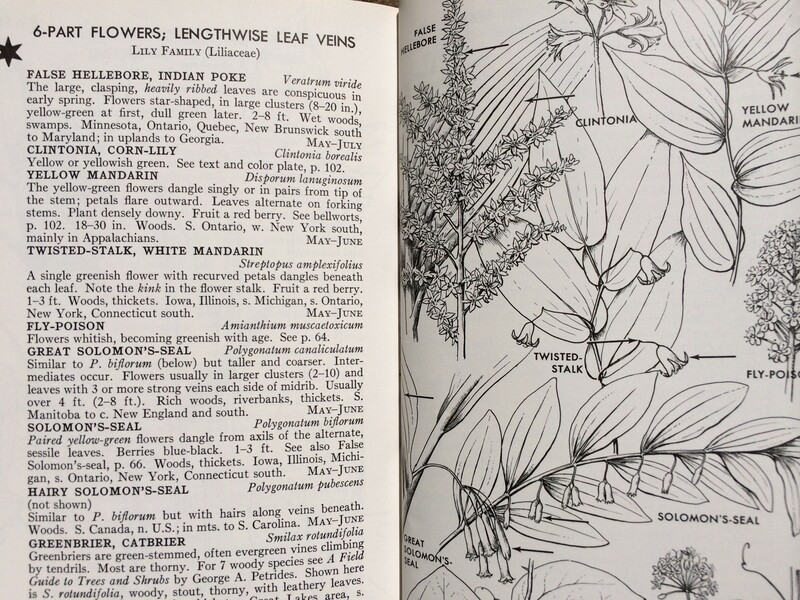 It is not in Roger Tory Peterson and Margaret McKenny’s A Field Guide to Wildflowers, so when I discovered it as a young girl in Vinegar Hollow I felt like a genuine plant explorer. I finally tracked it down in Joseph E. Harned’s Wildflowers of the Alleghanies, a book I found by chance at a second-hand bookstore. It has been called “a monumental book,” and there is no doubt that it is–written with grace and comprehensive in scope. “Micranthidifolia” remains one of my favorite botanical tongue twisters. 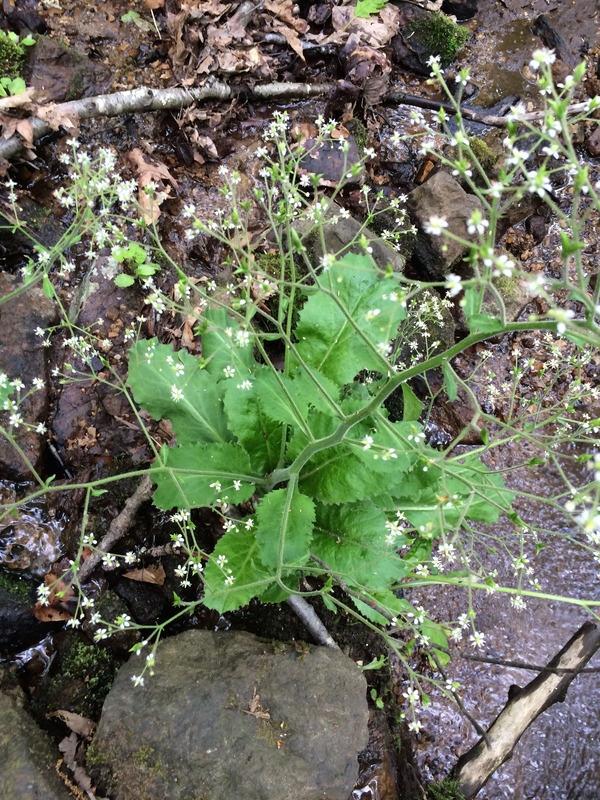 The mountain lettuce are abundant and so is the plant shown below, which is new to me. It takes several hours of searching online to find the name because for once Peterson and McKenny’s A Field Guide to Wildflowers fails to give me an identification, probably because it was such a big presence there in the stream, but quite small, practically hidden in the top right corner of p. 370 among the “6-part flowers, lengthwise leaf veins, Lily Family (Liliaceae).” Peterson and McKenny instruct through arrows, using them to point to distinctive, often little-noticed features. They do have an arrow to the “heavily ribbed” leaves. I should have noticed that arrow, but I missed it. Drawing of false hellebore (shown left of center on top) from Roger Tory Peterson and Virginia McKenny’s A Fieldguide to Wildflowers (pp. 369-379). False Hellebore is also known by a host of other names, including Poor Annie, Tickleweed, and Devils Bite. This plant is not palatable, in fact just the reverse. According to one website, it is highly toxic and can cause “birth defects, gastrointestinal distress, salivation, prostration, general paralysis, spasms, irregular heart beat, difficulties breathing, and death.” That sounds like just about enough results for its toxicity. Large patches of bluets carpet the path the follows the stream up the glen. 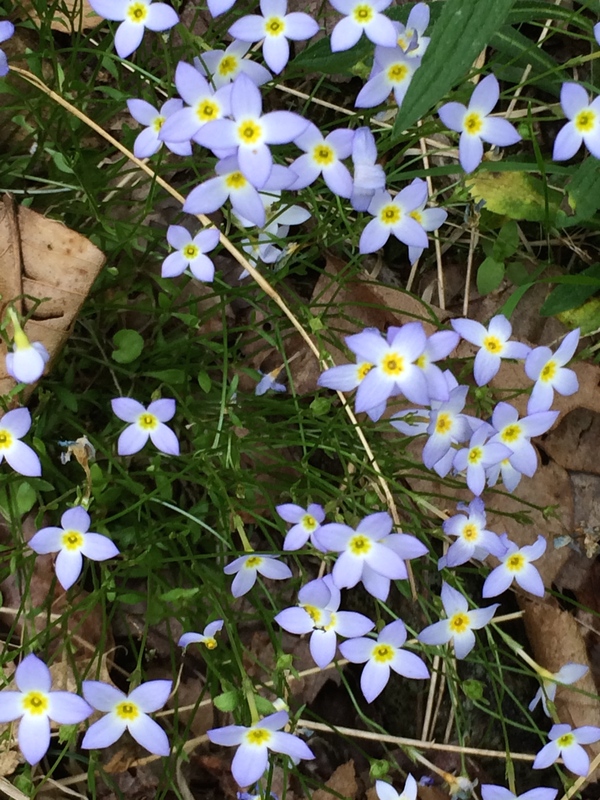 Bluets, also known as Quaker Ladies, Innocence, and Little Washerwoman (Houstonia caerulea). 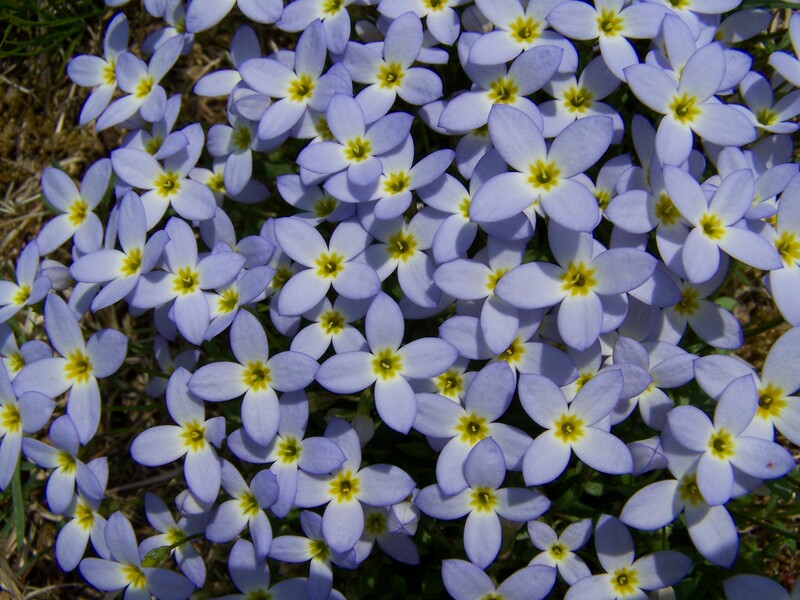 Bluets go by many names as well and are extremely photogenic. It is certainly a pleasure to walk along a path so blue, though I am hopping because I do not wish to crush a bluet or a Quaker lady or a little washerwoman. They are in the bedstraw or madder family (Rubiaceae). The settlers are said to have stuffed their mattresses with the common bedstraw (Galium sp. ), which grows in hay meadows and has a sandpapery feel. 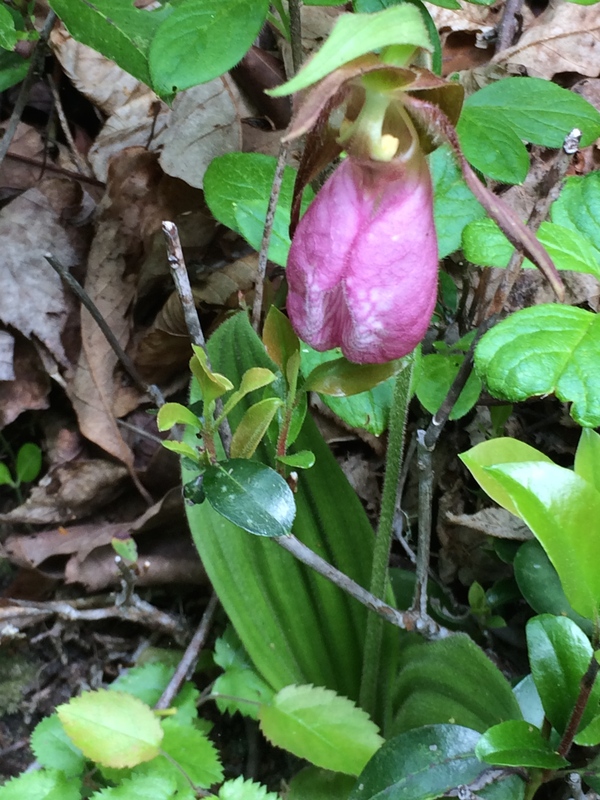 Probably because I am so dazzled by the mountain lettuce, the false hellebore, and the bluets, I fail to notice two species that we see on our way back through this part of the parcel: the pink lady’s slipper and the pinxter flower, a kind of rhododendron. Lady’s slipper orchid (Cypripedium acaule). 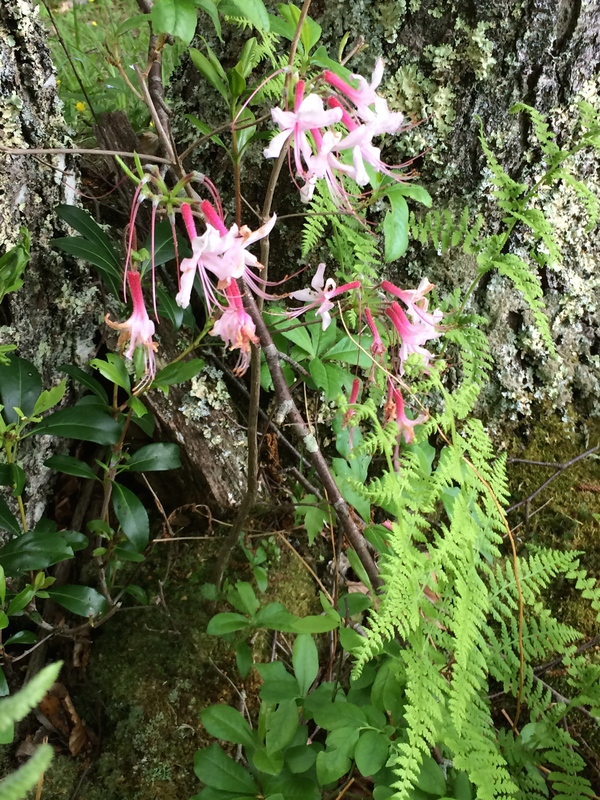 Pinxter flower nestled into trunk of tree with hayscented fern. I was dazzled, but now I am delirious. 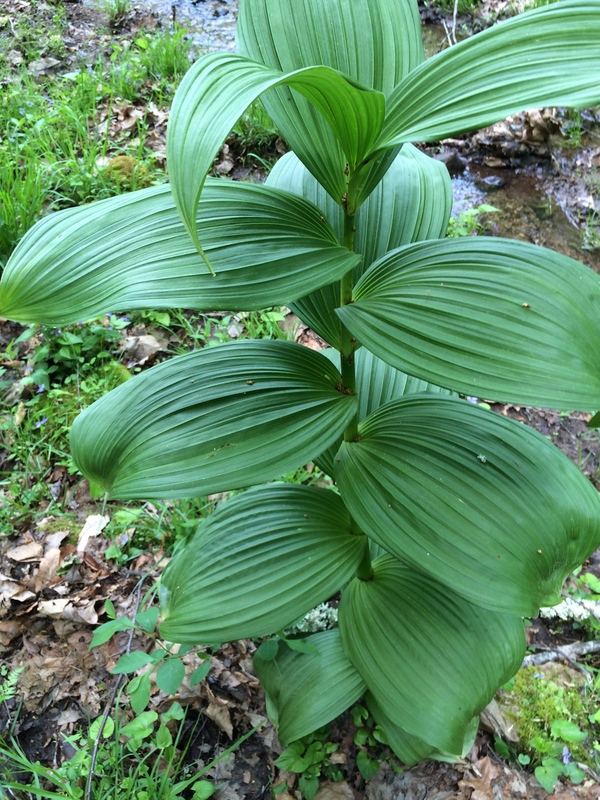 These Appalachian plants touch me deeply. Pinxter flower has had several scientific names, from Rhododendron nudiflorum to the current Rhododendron periclymenoides. Nudiflorum makes perfect sense (flowering without leaves), but I will have to do further research to understand how periclymenoides adds to an understanding of the biology of this species. 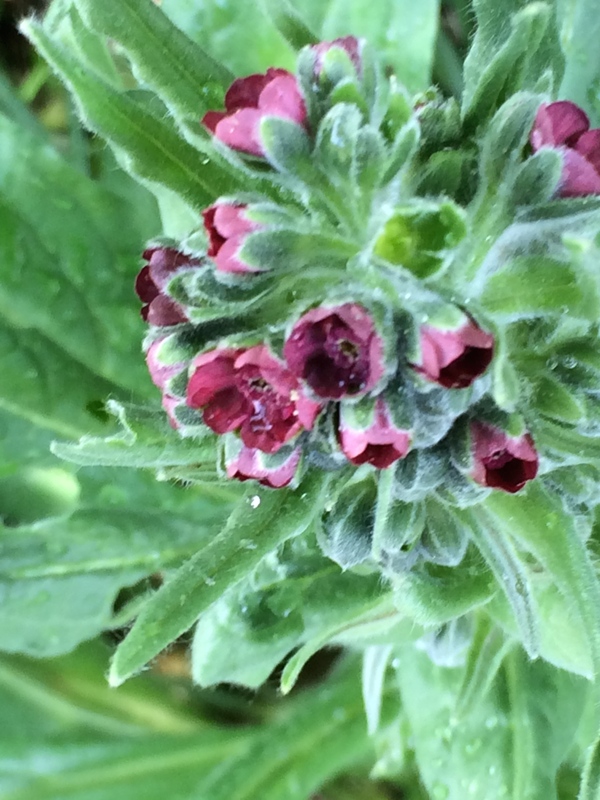 We trek on, discovering an old friend from Vinegar Hollow, hound’s tongue, a member of the forget-me-not family–“downy, with a mousy odor; maroon flowers …embraced by velvety calyx scales” according to the description by Peterson and McKenny. I think I have caught its downiness in my photograph (enhanced by the slight out of focus). This is limestone country. One of my companions has worked with stone. He points to a rock with a lot of character and shows us where bear have overturned rocks to get at ants. 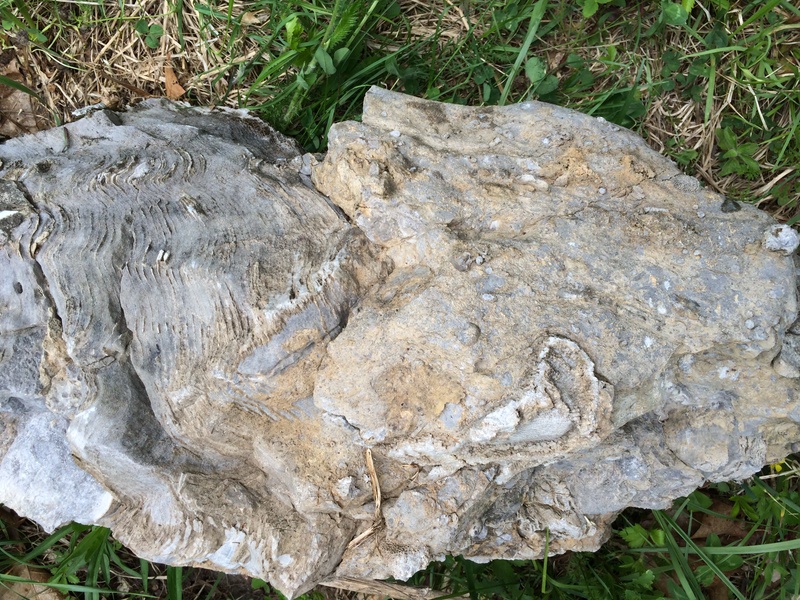 Limestone rock showing fossil creatures. 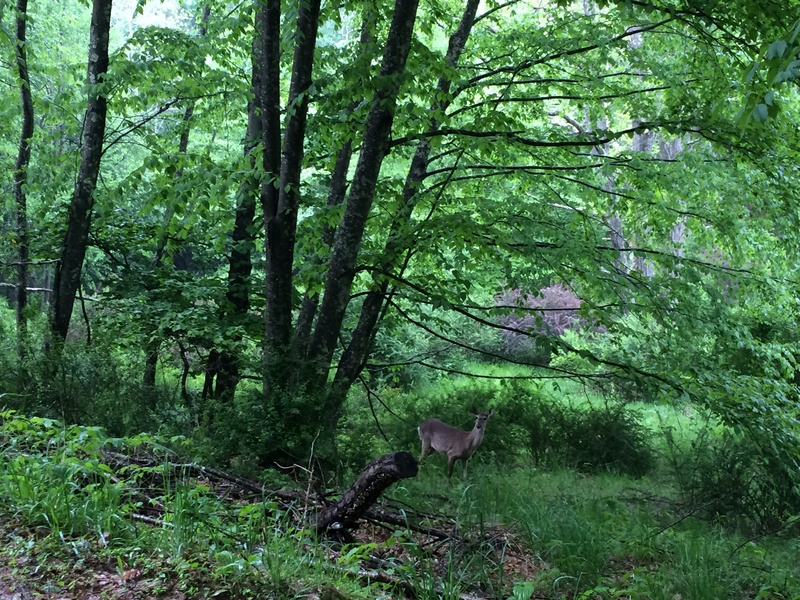 We lock gaze with a deer. We reach the top of the parcel. At the top of the parcel. The Vanderpool gap is still visible. Two stick-like black locusts stand in the center of view. The locusts are very late leafing out this year. One hopes that a blight or new pathogen is not attacking this very valuable and beautiful species. As we walk back down to the jeep, ticks, rather large ticks, attach themselves conspicuously to our pants and soon appear on our arms. My youngest companion, wearing medium-weight blue jeans, shoos away more than 30 ticks, while my companion with camouflage pants has less than half that amount, and I, with rubber wellies, only attract 10 or so. We speculate about the relative merits of what we are wearing with regard to attracting ticks, but are most preoccupied with just getting the ticks off of our clothing and bodies. One of my companions describes a nature program that showed a moose in Canada driven mad by blood-engorged ticks covering its body. We lament how hard it is to feel charitable towards this particular species. A superfluous hostility, however, should be avoided. Basically little arachnids, ticks are an old species, having been found in fossil amber dating back to sometime in the Cretaceous (65 to 146 million years ago), according to some researchers. They make their living in an unsavory way, but then so do some humans. The pinxter flower, the mountain lettuce, the false hellebore, a golden eagle, a deer, vultures, and ticks. These species and many more we have encountered on our walk. We are fortunate to have had this opportunity to walk in the Appalachian mountains of western Virginia in Highland County. 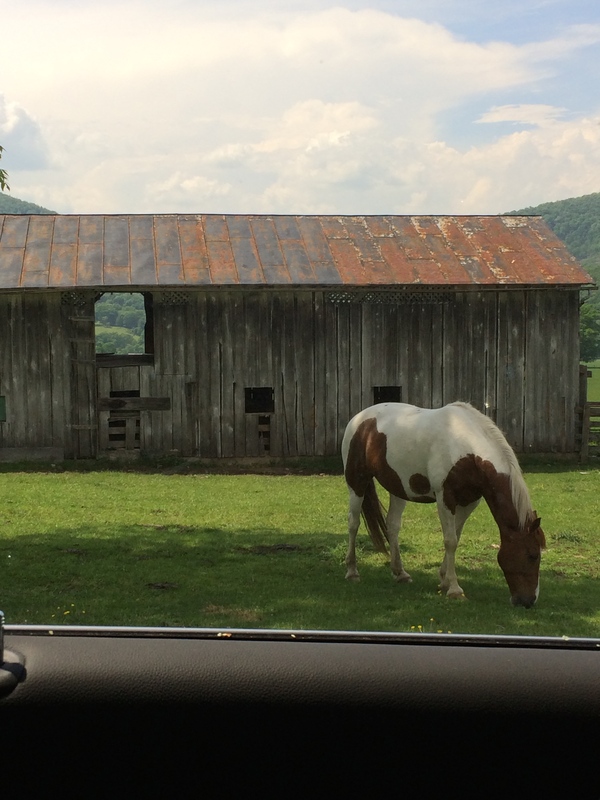 Upon returning to where we started, I find horses by the barn near where the cattle grazed, and a view through a window of that barn. Back to the beginning. A horse grazes. Vanderpool gap visible through window in barn. Our walk is like a view through the keyhole. We have seen so much, but not everything. A parcel of land on the wild side is immense. The diversity of life forms, from bluets to ticks, inspires in me wonder and happiness. P.S. 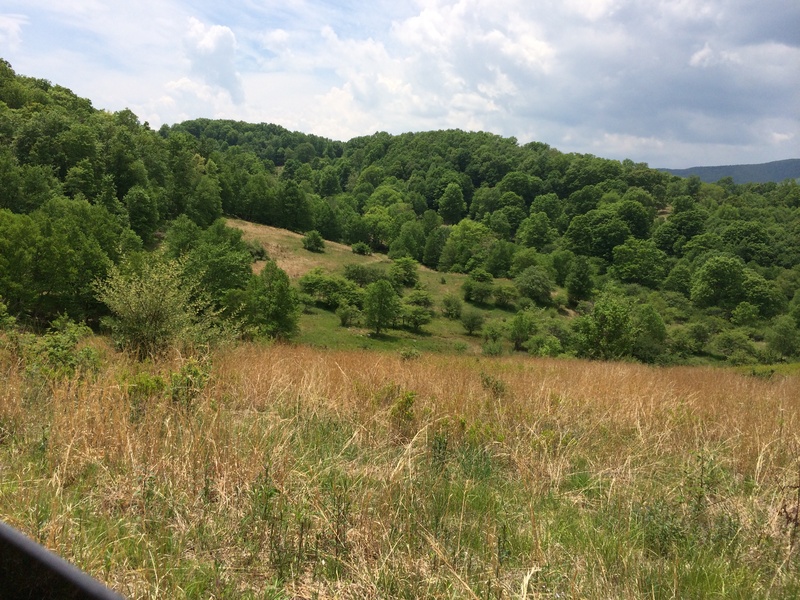 An excellent article on the topography, biodiversity, and habitat loss of this area, titled “Appalachian-Blue Ridge forests” is available on the World Wildlife website.